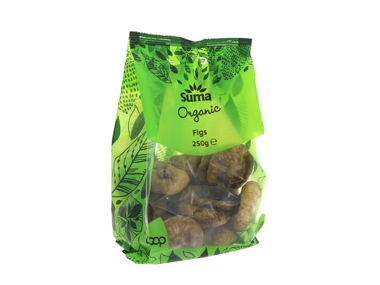 Buy Suma Organic Dried Figs 250g in the UK from our online shop or directly from our independent Scottish store. Use for baking or as a healthy snack. High in magnesium and calcium. Figs have a high natural sugar content as well as being rich in B vitamins, calcium and magnesium. This ‘fig bread’ uses no flour so is naturally gluten-free. Its an amazingly tasty and simple recipe that’s great eaten as a snack during the festive period. This recipe contains 300g Figs, dried (stalk and centre naval bit removed). As official Suma stockist, we sell genuine Dried Fruits directly from our shop in Scotland and online throughout the UK. Where can you buy real Figs 250g - Organic safely online? If you are wondering where you can buy Suma Organic Dried Figs 250g safely online in the UK, then shop with us. We are an actual health foods shop; with real people selling real foods and products. Our award-winning independent shop is located in Stirling, Scotland since 1976. You can buy our Beans, pulses, grains, flours, seeds and dried fruit and other genuine Dried Fruits in store or safely place an order with us online or over the phone. Figs 250g - Organic - Suma Organic Dried Figs 250g in Dried Fruits and Foods.